Bad Influence! began during the 16 bit-era of computer and video gaming, and featured in-depth news, previews and reviews about the very latest in gaming and computer technology. The series ran long enough to feature the launch of the Nintendo 64 console (then acknowledged by its working title, the Ultra 64) in its fourth and final series. The show was originally presented by then children's TV presenters Violet Berlin and Andy Crane (of 1980s CBBC Broom Cupboard fame [The Broom Cupboard being the nickname for the CBBC's continuity announcer's booth]), who were studio based, and US teen actor Z Wright, who filed location reports from the US until Series 4. There was also a cheats segment character called Nam Rood (played by Andy Wear), an anarchic "furtler" who lived in a shed in the first two series, and then in the basement for Series 3. He would give viewers gaming cheats (written on cards he would stick to his forehead) in between mock experiment comedy sketches three times per episode. He would always greet viewers with his trademark catchphrases "slimy furtlers" and "scrotty furtlers", the term "furtler" equating to the term "techie". Other features included three game reviews per episode - one in depth and two in brief - by teenagers local to the area where Bad Influence! was produced, namely the city of Leeds in West Yorkshire. Although these teenagers stints on the show varied, a small number appeared in all four series of the programme. Although the majority of mid-programme reports were filed from the US by Z Wright, they were sometimes filed by Violet Berlin and on rare occasions by Andy Crane, in place of Z Wright. 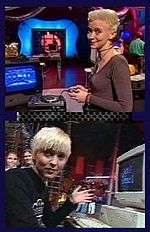 The programme usually focused on PC and Amiga segments early on in an episode, with more console-based segments later on. There was also a weekly competition towards the end of the programme, directly before one of the show's most distinctive features - the 'Datablast' sequence. The Datablast - which viewers were encouraged to record on their video recorders - consisted of a number of pages of gaming articles and information that were flashed rapidly onto the screen during the credits. Viewers could then read the pages by replaying it in slow motion on their video player. The information consisted of a watered down version of most of that episodes features, as well as some exclusive content, such as Top Ten video games charts. In Series 3, the show experienced a revamp. The virtual reality title sequence and credits, which by the end of Series 2 had begun to look somewhat dated, were replaced by a new, industrial-style title sequence, influenced by the mega-flop beat-em-up Rise of the Robots. There was also a remixed, industrial-style theme tune and a slightly more anarchic feel to the show, suggesting it was now targeting a slightly older teen audience. This demographic refocusing was in tune with gaming trends which were moving more towards older teens and younger adults, yet at odds with CITV viewer trends which showed that CITV audiences were actually getting younger. Also in Series 3, the Datablast section only appeared once, at the end of the series, which would prove to be its final appearance. Also making their final appearance were Z Wright and Nam Rood. In Series 4, the final series, Z Wright had been replaced by Violet Berlin presenting global reports (rather than solely US reports) and she was also granted her own slot, called Virtual Violet. Back in the studio, Crane was now joined by new co-presenter Sonya Saul. Nam Rood and the Datablast had both been discarded. In the final edition, Berlin, Crane and Saul all presented together in the studio, the only time this ever occurred. ↑ Bad Influence! : Violet Berlin, Andy Crane, et al.